MILWAUKEE — Call it a manipulation or sometimes just offering a sage’s advice, but Floridian Sam Beam is an expert confessor. Whether it’s admitting to flubbing lyrics onstage or whispering secret wisdom through his spooky, delicate songs, Beam (also known as one-man acoustic entity Iron & Wine) lays it all out so as to extend an invitation to a kind of conspiracy. On Thursday night, Beam made his musical plot much deeper, debuting three-fourths of his recently recorded but unreleased new album before a friendly, packed crowd at Milwaukee’s majestic Pabst Theater. He battled rustiness and occasionally struggled with the new cuts, but the audience was fervent in their support and he never surrendered his power to draw listeners into his world. Like the pretty 20-somethings in the commercial, Beam wrestles with the themes that consume most young songwriters — desire for belonging, forlorn love and contemplating the future — but through his allusive voice, his lyrics and atmospheric guitar work, he’s able to make his introspective folk songs curiously unique and refreshing. His tunes are like ponderous notes passed between friends, albeit the most unashamedly poetic, naturalistic and fatalistic. That same seriousness doesn’t carry over onstage. On Thursday, Beam’s demeanor was a bit goofy, his dry, self-deprecating chatter formed a commentary throughout the hour-and-a-half show as he’d tune his guitar. Dressed in a red sweater, well-worn jeans, a scarf and sporting new, chin-length hair to match his Jesus beard, he looked like the personification of a hippie troubadour, but one beloved by the sensitive, heavily pierced indie-rock fans. If Beam’s intention for this one-off show was to test the songs in America’s heartland, he made a wise choice. A slightly riskier idea was to play this show solo. First, Beam was clearly underrehearsed, particularly with the new songs, and he frequently broke down as he juggled playing and singing. Second, he played without the assistance of the backing band that he usually carts along with him. This left no one to compensate for any slipups. He didn’t seem bothered though. His recurring mistakes were laughed off and then greeted with sympathetic cheers. Notwithstanding that, Beam could buckle down and give magnetic performances. Fewer instruments didn’t clutter his guitar playing, which was impressive, and gave his voice more room to maneuver. His singing was richer, warmer and more forceful than on his handful of albums and EPs. Sometimes bathed in a honey-colored lights, he looked like a younger brother of the ZZ Top guys. However, the crowd response was stronger for “Naked As We Come,” “Free Until They Cut Me Down” and “Upward Over The Mountain,” which were closer to the recorded versions, and each met with enthusiastic applause, as if the audience was savoring something familiar. The new tunes are a direct continuation of the Iron and Wine sound. As is his practice, Beam has constructed the new songs mostly around unusual acoustic guitar riffs as opposed to chords. He repeats the fragments until they become monotonous, allowing the plucked notes to reverberate and allowing slight changes to the tempo or tone to add variety and skew meanings. Beam’s opening act, the 1900s, shared a similar fondness for that kind of music. Despite the Chicago-area combo’s name, the group obviously has the late ’60s and early ’70s in particular on their minds. The seven-piece’s music harkens back to some of the sounds emerging from that era’s Topanga Canyon in California, varying between super-sunny jangle-pop of the Mamas and the Papas to Ricky Nelson’s country-rock period. Their set was short and impressive, and their merch table was doing brisk business after the show. Beam certainly seemed ill-prepared as compared to the 1900s’ tight set, but he was always able to compose himself and swiftly reclaim the seriousness in his songs. “It’s all pro here,” he joked. He finished strongly. 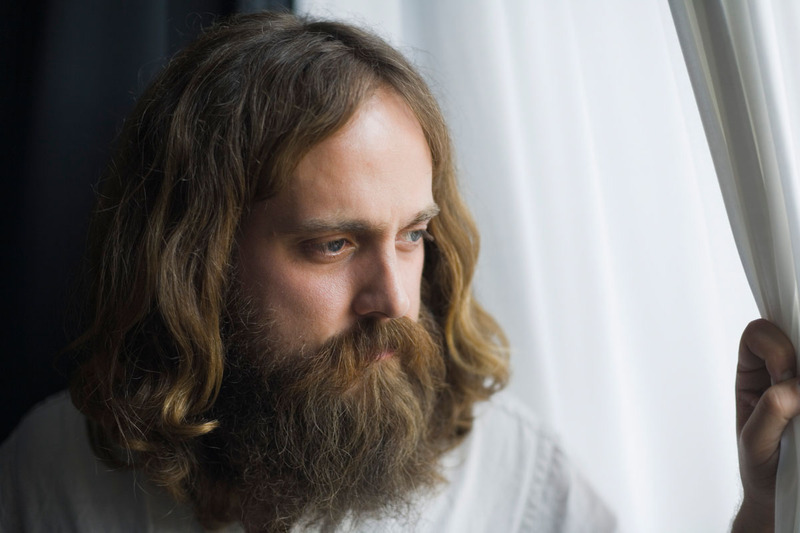 His set-closing song, “The Trapeze Singer,” is a moving mini-epic that is a tender letter with a Dante-like trip to heaven, and should have a slot reserved on Iron & Wine’s greatest hits disc. Fighting to keep pace, he wrung every word of its inherent meaning, which tries to coax an erstwhile friend to remember all their shared memories, a love of mischief and fun. The song sums up the underlying meaning of all Iron & Wine’s albums and his core message to those seduced by them: Come on in and enjoy. Tags: 1900s, Iron & Wine, Iron And Wine, Milwaukee, Pabst Theater, review, Sam Beam, Wisconsin. Bookmark the permalink.